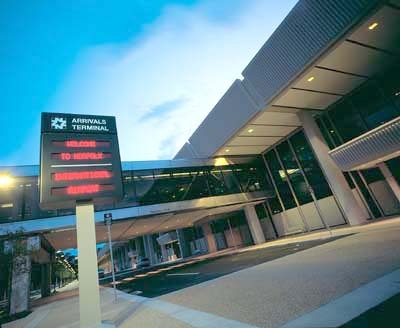 PARKING LOTS AND GARAGES: All parking facilities contain disabled parking spaces which are located at the closest point to the main passenger terminal. In Garage A, these spaces are conveniently located on each level near the elevators. In Garages B and C, the disabled parking spaces are all located on the ground level. A total of 144 convenient parking spaces at least 96 inches wide are reserved for the disabled. In long-term parking lots, the prevailing rates apply to disabled patrons. Rates are $1 per each half hour (or any part thereof) with a maximum daily rate of $9. Disabled patrons are permitted to park at no charge for the first four (4) hours in short-term parking lots only. After the first four hours in our short-term parking facilities, prevailing parking rates apply. Short-term parking rates are $1.00 for each half hour (or any part thereof) with a maximum daily rate of $24.00. 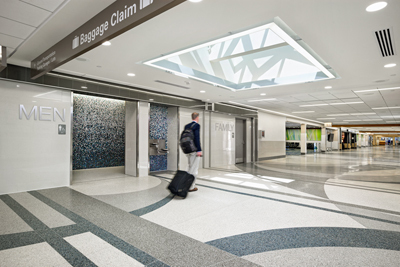 ENTRANCES: Departures and Arrivals Terminals Located at curbside, ground level. Short-term lots have 4 exterior steps, 6 inches high. Handrails on left and right. Ramps are provided curbside at both complexes. Automatic double doors designed to accommodate wheelchairs. Steps inside lobby, adjacent to escalators. Each step 6 inches high, marked with tactile strip/color change. Handrails. SIGNAGE: Directional signage is printed in contrasting color. Exterior signage lit at night. ELEVATORS: Elevators are conveniently located throughout the Main Passenger Terminal, Arrivals (baggage claim) Terminal and parking garages. All elevators are wheelchair accessible and are identified with the standard graphics used to designate handicapped facilities. Elevators have raised markings on the control buttons and sound indicators. PUBLIC REST ROOMS: Throughout Departures and Arrivals Terminal lobbies and concourses. No steps. All restrooms feature at least one accessible stall with 36 inch wide door opening out, handrails, 19 inch raised toilet seat designed primarily for non-ambulatory use, 11 inches between commode and wall. Accessible stall checked regularly for obstructions. Sink height 33 inches. Doors are 48 inches wide. Turns to enter. Restrooms are also equipped with full-length mirrors, low-level paper towel dispensers/hand dryers and sharps medical waste disposal containers. FAMILY CONVENIENCE ROOMS: In Departures, Arrivals Terminals and on Concourses A and B. No steps. Two separate rooms with baby changing station, sink 33 inches high with full-length mirrors, low-level paper towel dispensers and and sharps medical waste disposal containers. Restroom is private with 36 inch wide door opening in, handrails, 19 inch raised toilet seat designed primarily for non-ambulatory use, 11 inches between commode and wall. Doors are 36 inches wide. MOTHER'S ROOMS: In Departures and on Concourses A and B. No steps. One room with baby changing station, oversized rocking chair, sink 33 inches high, low-level paper towel dispenser and four electrical outlets. Room is private with 36 inch wide door opening in. DRINKING FOUNTAINS: Water fountains throughout the terminals are positioned at a level comfortable for use from a wheelchair. Bottle fill stations are located on both airline concourses and are positioned at a level comfortable for use from a wheelchair. WATER FILL STATIONS: Water fill stations located on Concourses A and B are positioned at a level comfortable for use from a wheelchair. TTY TELEPHONE: A TTY (text telephone) is available and accessible 24 hours daily in the Norfolk Airport Authority Police dispatcher's office (basement level in the main terminal). The local phone number is 757-857-3872. FOOD AND BEVERAGE: All food and beverage concessions are ADA-compliant and wheelchair accessible. The airport has full-service menu restaurants, fast food, gourmet coffee, and healthy snacks. Tables are 29 inches high with adequate aisles between tables. Staff available at all locations to assist with special needs. SHOPPING: All retail concessions are ADA-compliant and wheelchair accessible. The airport has a variety of retail stores, newsstands and specialty gift shops. Counters are 36 inches high with adequate aisles between displays. Aisles clear of temporary displays. Staff available at all locations to assist with special needs. PROCEDURES: Upon request, the airlines will provide wheelchair assistance. Wheelchairs can be reserved in advance by calling the airline or can also be requested upon arrival at the passenger terminal by contacting any skycap. Walkers, crutches, and canes may be taken aboard the aircraft. Guide dogs are usually allowed to travel on the plane. Call the airline in advance to verify their policy and to make arrangements. PASSENGER LOADING BRIDGES: The use of modern terminal-to-plane loaders permits direct access to and from the aircraft, in most cases, without the necessity of ascending or descending steps between plane and terminal. Contact your airline to inquire about special lift capability for their aircraft in the event of ground loading. AIRPORT SECURITY PROCEDURES: TSA staff will assist with getting bags through passenger screening. Travelers with mobility disabilities or in wheelchairs may be asked for consent to pat down search in accordance with federal regulations. 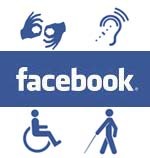 Current procedures by type of disability can be found at this link to www.tsa.gov. FIRST AID: Airport firefighters and police officers are certified to perform Cardiopulmonary Resuscitation (CPR) and use Automated External Defibrillators (AED) to treat sudden cardiac arrest. Twenty-six AED devices are located throughout the Airport terminals. Advanced emergency medical response and transport is provided by Norfolk Fire and Rescue. Passengers traveling with medications and medical devices should consult the TSA's website for information and instructions. Link to the TSA site for medication information. Passengers traveling with portable oxygen concentrators must contact their airline to insure that portable oxygen is approved for in-flight use. GROUND TRANSPORATION: James River Transportation (located inside the Arrivals Terminal near baggage carousel 3) provides shuttle service to all cities and military installations in Coastal Virginia and northeast North Carolina. ADA-approved vehicles with lifts can transport individual passengers or groups with space for two standard wheelchairs or one motorized (oversized) wheelchair. Reservations required. Contact James River Transportation at 866-823-4626 or online. Link to www.jamesrivertrans.com. ADDITIONAL INFORMATION: Airport is an ADA-compliant, non-smoking facility. Luggage handling is also available. Wireless internet access (WiFi) is available in all public areas of the terminals. One hour of complimentary internet access - great for checking your email or light web browsing with affordable rate plans are available for more usage. 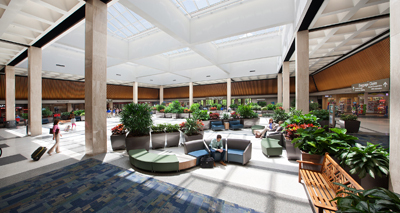 Norfolk International Airport’s map is available on our website. Link to current terminal map with option to download in PDF format.